Despite the earnest protestations of some tour guides, the Globe is not the Globe—that is to say, it is not the place where Shakespeare himself wrote and performed. The indoor Sam Wanamaker playhouse sets itself at another step of distance: it is not Shakespeare’s own Blackfriars Playhouse, or even named after it. And the trial of Sir Walter Ralegh taking place within it is not his trial—except for the ways in which it sort of, kind of, is. And as it is a trial that hinges, in part, on a failure to disclose connections, I should mention I do research at the Globe, though I wasn’t involved with this or any of the winter productions. Actor Oliver Chris has compiled accounts and transcriptions of Sir Walter Ralegh’s 1603 trial for treason to create an evening of verbatim theatre that plays with the boundaries of then and now in the same way as the Globe’s reconstructed spaces themselves. The words are real, but they are spoken by a court in dressy suits and ties, the historical figures played by women renamed and re-titled accordingly. Twelve audience members are designated (in advance, by their own choice, don’t worry) and they are sworn in and escorted out to deliberate, and in the end render a verdict that apparently really does sometimes defy history. Assuming you know the history, of course, which I only did dimly—not enough to be totally sure that my memory was correct, especially as the trial progressed, the balance pinging back between Simon Paisley Day’s wry Ralegh and Nathalie Armin’s fanatically determined crown prosecutor, Coke. But whether you know what the right answer will be or not, there is a frisson of uncertainty—that delightful theatrical possibility that things might go wrong—that seems utterly at odds with the premise of verbatim performance. The acknowledged and active presence of the jury, the characters’ continual appeals to the spectators places us, in a way, within the historical text itself, knowing as we do that these same references must have been made at the time. How much power do we have, then, do influence the outcome? It’s a question that’s never fully resolved. That tension is in itself fascinating, though, and reflected in the burst of protest from the audience that greeted the reading of the verdict. At one performance during its run in Winchester, I was told, the jury argued so volubly, the rest of the audience could hear them shouting. We are poised in possibility, in contention with history rather than submissive to or passive observers of it. Even if the outcome of the historical event can’t change, in a way, history itself can—that is, our understanding of it, and of the people in it. Sir Walter Ralegh, dashing, cape-tossing, potato and tobacco-bringing adventurer is recast from the swashbuckler of popular imagination—as, perhaps, he was in life by the death of Queen Elizabeth and the shifting priorities of King James. From a series of documents that could in theory feel impossibly dry and distant, Chris excavates moments of startling humanity: Coke slipping into a petulant sulk and her clerk’s embarrassed confusion, the judges’ affront at an implication that they have not done their jobs properly. The dry self-regard of Simon Startin’s Sir Robert Cecil springs into a fully-formed sense of identity in only a few lines—he is the centrepiece, too, of one of the odder and more amusing exchanges, about a book that once belonged to Cecil’s father. A reconstructed space, a reconstructed text, a reconstructed event—and us. This piece itself might be yet another layer of reconstruction by the time you read it, as Ralegh is only playing through the weekend. Under Michelle Terry, the Globe seems to be re-evaluating what it means to be a historic space, and how to look beyond costumes, casting, and staging in seeking to evoke and explore elements of Shakespeare’s time. How can you recreate the mix of inevitability and tension of a trial under an absolute monarch? The feeling of seeing the hero of another age fall? The blurry Renaissance sense that the past was always also the present? It’s this last sensation in particular that Ralegh conjures, court procedure and candles and Latin and lanyards and all. 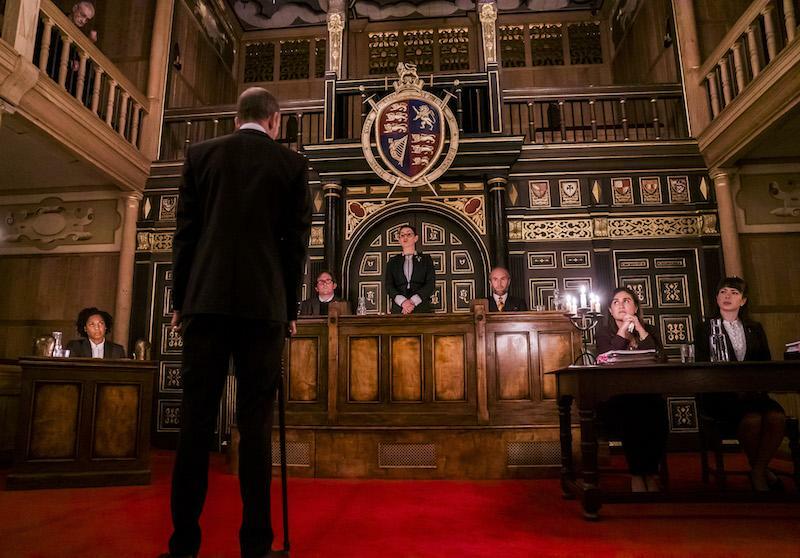 ‘The Ralegh Trial’ is on at Shakespeare’s Globe until 30th November. More info here.